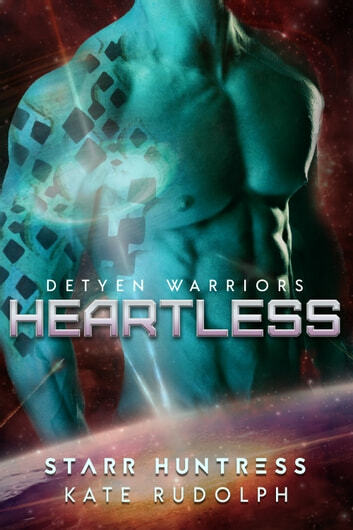 After witnessing the impossible mating of his fellow soulless warrior, Kayde doesn't expect a denya of his own. But whenever Quinn Porter walks into a room, he can't keep himself from watching her, from following her, from wanting her. And those desires mean trouble for a man who isn't supposed to feel anything. Sure, she was captured by pirates and abused for months, but Quinn's doing her best to stay positive and create a good life back on Earth than. She has a small group of friends made up of fellow survivors and the determination to recover from all that was done to her. She's not in the market for a man, but a certain coldly loyal Detyen could make her change her mind. When Kayde undertakes a mission to journey back to his Detyen home, he's ready for the solitude. What he doesn't expect is Quinn hiding away in one of the bunks on his ship. Forced to undertake a dangerous mission together, even knowing that the remnants of emotion he feels when she's around might be signs of oncoming madness, Kayde and Quinn will need to rely on each other when everything goes wrong and their lives and freedom are at stake. 2 months ago Quinn , Muir, CJ, Valerie, Davy, and Laurel had been saved from slavers but a mind control chip was put into Laurel's head and Valerie left her behind so she never made it back to earth with others. Kayde is a Denyen and part of the team that saves them. He is also past his time to find a denya (mate) and would have died on this 30th birthday. So he let the Detyen legion remove his soul and he became a souless. But then he meets Quinn Now he is on a mission Oh I love the Action, twist and turns In this adventure. The characters are fantastic. It's full of betrayal, mystery, intrigue, drama, spice, and so much more. I couldn't put it down. Each story has its love story but they also build off each other too for a big plot line! It's a realy fun read. I can't wait for the next book Voluntarily reviewed a copy and I honestly loved it. I enjoyed reading this book , it has a great storyline. I can't wait for more from this author. I received this book as a FREE ARC copy to read and I voluntarily leave this review.